BigCommerce store owners can manage the products from this Section. They can view the products details such as the product type, SKU, Barcode, Product Status, quantity, price, and etcetera on the Manage Products page or on the editing page. They can also edit the product information. Get Product Status: Get the current status of all the uploaded products from sears.com. Update Inventory: Updates the inventories of all the products on sears.com. Update Price: Updates the prices of all the products on sears.com. Select & Sync Products: Synchronize the selected product fields from the BigCommerce store to App. Bulk Action: Perform the selected bulk action on the selected products. All the products having valid SKUs are retrieved from the BigCommerce store. If there is any product with no SKU, then it is not listed on Sears Marketplace Integration app. Each variant must have unique SKU for every product. 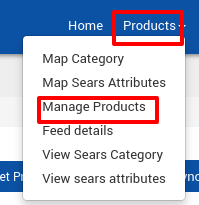 If any product has duplicate SKU, then it conflicts with the SKU at the time of product upload. To upload any products on sears.com, products must have Barcode (UPC, ISBN-10, GTIN-14, ISBN-13) with it. Admin can add or Update the Barcode(UPC, ISBN-10, ISBN-13, GTIN-14) from the Manage Product section of the BigCommerce admin panels. Product price must be assigned to each product. Admin can update the product price while editing the product from the app.